Always full of bargains, merchandise, and mingling, Greenlawn Grove Flea Market is a great place to buy or sell. The market has over 350 dealers who come every weekend to sell new and used items such as collectibles, jewelry, music, clothing, antiques, tools, electronics, and much more. 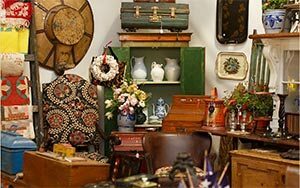 No matter what you’re looking for or looking to sell — there is an eclectic mix of everything at this lively market. With over 50 years in the flea market business, Greenlawn Grove is a perfect place to make some extra cash. Their vendors range from wholesalers to small businesses to individuals. Located south of the Detroit Metro Airport, the market offers free admission and parking, although the parking is limited. They ask that vendors use only one car to setup and bring any helpers along so there will be plenty of parking spots for customers. Table rentals are $20 and up and the cost to reserve a spot starts at $10, which you can do the Friday before the market opens. There are a variety of selling spots including single spots, corners, double sized, trailer sized, as well as others. Each spot gets one table to work with, and vendor setup starts on Friday from 9am to 3pm. Admission to the public opens on Saturdays and Sundays year-round from 7am to 3pm.